This entry was posted on Friday, April 4th, 2008 at 6:29 pm	and is filed under Main Dishes, Middle Eastern, Recipes and Remembrances. You can follow any responses to this entry through the RSS 2.0 feed. You can leave a response, or trackback from your own site. Is this a lebanese dish? we made fattah on our blog a long time ago and i agree, it’s totally not photogenic! 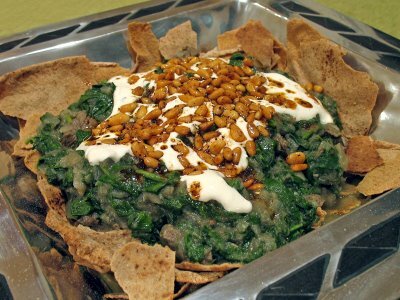 ours was a traditional lebanese dish but didn’t have spinach. just curious! WANF — The book we got the recipe from contains those from Lebanon, Syria, and surrounding areas… at the very least it was inspired by the flavors of the region! I actually think this looks GREAT! I made a very similar Turkish dish on my website “http://www.whatyouhavingforyourtea.wordpress.com”. The layers of textures are just amazing. I’m going to give this one a try. The recipe I followed was from Claudia Roden’s book, ‘Arabaesque’, which explores food from Morocco, Turkey & Lebanon. She’s an amazing food writer. It is actually Nick my 20-year old son who told me “mom, you got to call it something American can relate to”! I was going to call it Mexican-style, not as catchy!